Industrial agriculture is a form of food production that treats a farm like a factory that produces animal products. The primary objective of factory farming is to maximize yield and profit. Economic rewards generally supersede environmental, health, and animal welfare concerns. To enjoy the benefits of economies of scale, factory farming must be large-scale and intensive which necessitates the use of off-farm inputs. In addition to off-farm inputs, intensive production demands the use of large quantities of water, major transportation systems, and specialized technologies. The development of the specialized technologies used in industrialized agriculture provides interesting and well-paid employment opportunities. It also encourages close relationships between public and private research institutions which raises some concerns about the influence of private interests on publicly-funded research. Animals in animal feeding operations [AFOs] are confined for a minimum of 45 days. Very large AFOs are known as concentrated animal feeding operations [CAFOs] which house a minimum of 1,000 beef cattle, 700 dairy cows, 2,500 pigs weighing a minimum of 55 pounds, 82,000 egg-laying chickens, or 125,000 broiler chickens. Regardless of size, any animal production facility that removes manure via natural or man-made ditch, stream, or waterway rather than by spraying it in the form of a mist onto fields is classified as a CAFO. To keep animals in AFOs and CAFOs, the heavy use of antibiotics is necessary due to the sheer concentration of animals. In the United States, 80% of all antibiotics purchased are designated for use in livestock and 70% of those antibiotics are administered to healthy animals. Of those antibiotics, 30% to 60% pass through human and animal systems unchanged. Water treatment systems are also unable to filter the antibiotics from the water. As the existence of antibiotics becomes more concentrated in ecological systems, it becomes more toxic to animals starting at the microbial level. It has been found that the number of antibiotic-resistant bacteria dramatically increases while the number of species is dramatically decreased to only macroinvertebrates and fish communities able to survive in water with very low oxygen levels. AFOs and CAFOs also emit ammonia which creates hydrogen sulfide which becomes hydrosulfuric acid. When combined with water and particulate matter into the air, acid rain is produced. This affects the water in areas downstream from these operations. The primary benefit of industrialized agriculture is the dramatic increase in output and efficiency. Some assert this is the most important argument due to a burgeoning global population and a growing demand for animal products. Stemming from such a dramatic shift in production techniques, food manufacturing has become increasingly concentrated, and food economics have become vertically integrated. Consumers enjoy direct financial benefits from these changes in the form of lower food prices. However, the indirect costs incurred in the form of, for example, healthcare costs related to air pollution, decreased water quality from run-off, and increasingly concentrated control over the food production system the result of which is the funneling of income and tax dollars out of rural communities to corporate agribusiness. Moreover, very large subsidies funded by tax monies are paid to some of the largest agribusiness producers. Bleshman, R. (2011). 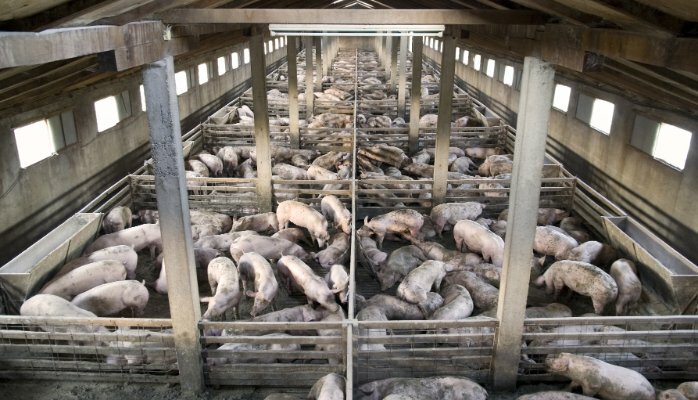 National Pork Producers Council v. U.S. EPA: Striking Down Clean Water Act Rule for Factory Farms, the Fifth Circuit Strips the EPA of Effective Regulatory Power. Tulane Environmental Law Journal, 25(1), 207-219. KERSHEN, D. L. (2013, August). The contested vision for agriculture’s future: sustainable intensive agriculture and agroecology. Creighton Law Review, pp. 591-618. Patel, P., Centner, T. J. (2010) Air pollution by concentrated animal feeding operations. Desalination & Water Treatment. 19(1-3) 12-16. West, B. M., Liggit, P., Clemans, D. L., & Francoeur, S. N. (2011). Antibiotic resistance, gene transfer, and water quality patterns observed in waterways near cafo farms and wastewater treatment facilities. Water, Air & Soil Pollution, 217(1-4), 473-489. Next PostNext question: what is aquaculture and why is it important?